This year’s 12 Days of Randonneurmas gift list has hit the weekend. I’ll keep it short knowing we’d all rather be out riding. Toward that end, I offer up the time-saving lube I’ve used this year: NFS, or Nixfrixshun by its full name. NFS is a thick, clear lube that is to be used sparingly. Inventor and cyclist Josh Simonds advises putting it on 10-12 links the first time applied, preferably to a clean chain, and spinning the pedals backwards until the cog distributes it over all the links. After that, wipe down the chain when it gets noisy and repeat with 4-6 drops. 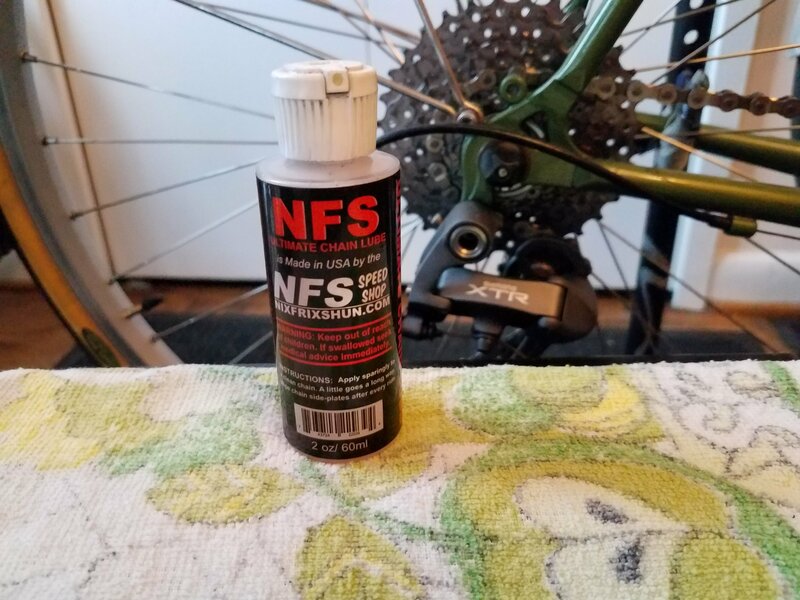 Unlike other thick lubes I’ve used, like Pedro’s Green, NFS doesn’t turn your chain into a sticky black mess. It still provides excellent lubrication in the rain. While it is more expensive at $15 a bottle, NFS lasts longer than regular light lubes or even specialty stuff like Boeshield T-9, my former favorite. Full disclaimer: Josh is a riding buddy of mine and introduced me and others in the D.C. area to NFS with free samples. He’s not asking me to make this endorsement, however, and I’ve purchased NFS at full price. I spend less time on chains and it’s worth it. See the full details at his online store. While you are at it, consider using an inexpensive chain checker before applying lube to see if the chain needs replacing. Removing worn chains early will save your drivetrain. I like the $11 Park CC-3.2. Have a great Saturday! Tomorrow: another vest, one for inclement weather.